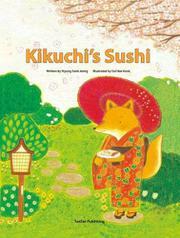 On the Japanese island of Hokkaido, a fox befriends a human sushi chef and discovers the secrets of making great sushi. When Fox first meets Kikuchi, she offers the elderly chef acorns in exchange for sushi. Instead, Kikuchi asks Fox to find him “the most delicious spring water.” Fox brings him to the deep valley, where a spring offers “the sweetest and most refreshing water.” “Sushi,” says Kikuchi, “tastes best when made with fine rice and delicious water.” Fox is “delighted by the taste of sushi melting in [her] mouth.” The next evening, Fox visits Kikuchi again. This time, Fox finds wasabi. “Real sushi needs the stinging taste of the wasabi,” explains Kikuchi. After watching Kikuchi, Fox thinks making sushi is easy. However, Fox succeeds only in making a big mess. Then Kikuchi has an idea! “Fox, your hands are small, so why don’t you try making a rice ball instead of sushi?” Fox makes the perfect packed lunch—rice balls stuffed with apricot and pickled fish eggs. Accompanying side notes discuss the history of sushi as well as other Japanese traditions such as matsuri, or festivals. Kaleidoscopic illustrations bring the text alive; rendered in delicate strokes and vibrant colors, peonies dance across Fox’s kimono, fatty streaks on tuna glint in the light, and pink shrimp mimic real life.